REVIEW: 'Wonder Woman' #4 by Greg Rucka, Nicola Scott, and Romulo Fajardo, Jr. Origin stories are revisited from time to time to remind readers of the path characters have traveled to get where they are. If you're a Batman fan, you've seen more than your fair share of his parents getting shot in an alley outside a movie theater. If you're a Superman fan, you've seen him crash land in a Kansas farm after escaping his exploding home planet. But for Wonder Woman fans, you've only just started to get the story told and retold this year. 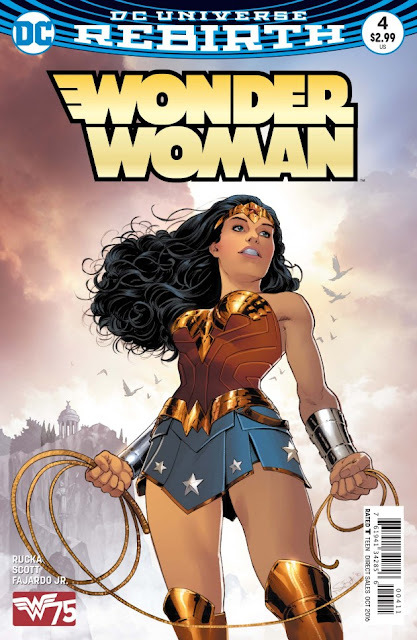 On her 75th anniversary, the Amazon princess is being celebrated with a number of great books revisiting her origin and the latest and greatest has been the new "Rebirth" title 'Wonder Woman' by Greg Rucka, Liam Sharp, Nicola Scott, and other talented people. This is one origin story I never tire of, filled with nuance, class, and pathos, Rucka and company have laid out a series befitting the stature of one of the most iconic comic book superheroes ever. After two brilliant releases of Wonder Woman stories - Earth One: Wonder Woman by Grant Morrison and Yanick Paquette, The Legend of Wonder Woman by Renae De Liz and Ray Dillon, DC Comics brought back former WW writer Rucka and artists Sharp and Scott for the main series. Alternating issues with different storylines, "Year One" with Scott and "The Lies" (present day adventures) with Sharp, make this bi-weekly title all the more enticing. Issue four's details aren't spoilers since we've seen Steve Trevor mended after crash landing on Themyscira and Diana chosen through the Games to be the one that returns him to man's world. It's the beauty of the execution of this story in both dialogue and art that separates this telling. With precision and love, 'Wonder Woman' beats with the heart of a lioness as Amazon culture informs Hippolyta's tough decisions as a leader and a mother. Rucka fleshes out a society that is regal and peaceful with customs and beliefs that shape their lives. There is a code of honor and respect of traditions. It's a civilization confident in their isolation, blessed by the gods, to prosper in a fully functioning society away from the rest of the world. What Rucka does in elegantly written dialogue, heartfelt and majestic, Scott demonstrates with captivating artwork page after page. The layouts are so clean and unfettered, each line is graceful and faces express more than words could express. It's these attributes of Scott's talents that elevates the issue to meet the lofty and almost poetic dialogue from Rucka. Romulo Fajardo, Jr. provides perfectly composed color schemes that are soft and varied, giving this utopia a bright positive outlook. 'Wonder Woman' has an embarrassment of riches when it comes to artists and we are all better for it. With titles like 'Wonder Woman,' it's no wonder sales of DC Comics have improved. When you have talented passionate creators churning out nearly flawless, well-conceived stories, that go to the heart of the character, it's easy to fall in love with DC again. Rucka, Scoot, Fajardo, are doing just that making WW a must-read and a must-see.